I am a dutch Organization Psychologist and long-time Free Software evangelist. I am currently the openSUSE community manager for Novell. Now, yes, that’s all minor versions but stability is a big deal! 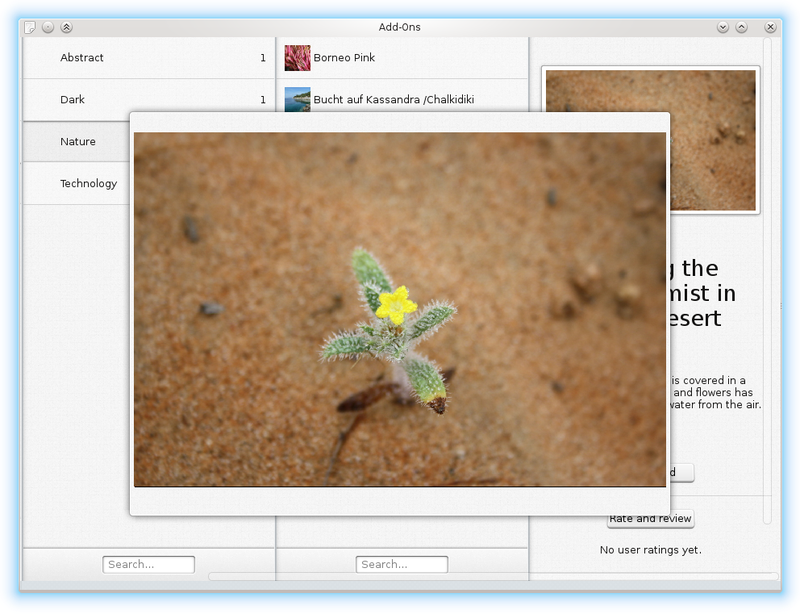 Qt 5.5.0 brought some problems for Intel users and this new version, combined with the improvements in the updates from the KDE community, brings a much nicer and more reliable experience to users. At the time of writing this, the openQA servers were busily running tests and, by the time we publish this article, they should be done. What was being tested? A massive amount of changes, bringing not only the latest Plasma 5.3 and Applications 15.04.1 to Tumbleweed, but also marking the switch to Plasma 5 as the default desktop! You can find an overview of major changes in the announcement of KDE Plasma 5.3 and the announcement of KDE Applications 15.04 two weeks before that. Some of the biggest improvements in Plasma Desktop include much improved power management and widget handling. New are a touchpad configuration module, Comic widget and some system monitoring applets and improvements to plasma widgets like Clipboard, Recent Documents. openSUSE 13.2 Is Coming – First Beta Has Arrived! oSC has started – follow us remotely! 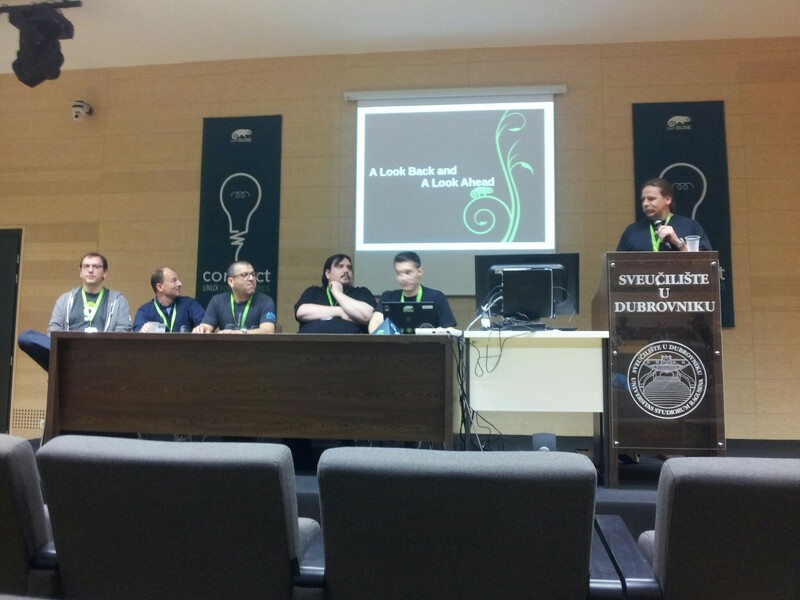 The openSUSE Conference 2014 in Dubrovnik was kicked off just an hour ago by the board, sharing some practical information with those in attendance, a call for help as well as a number of community announcements. Talks will be available via streaming during the event, make sure to check it out! The board brought up the state of openSUSE, including the release cycle (what comes after 13.1 is not clear yet), the changes to our processes (staging projects, openQA testing integration) and so on. This conference is a great time and place to discuss these things. The openSUSE Conference 2015 will take place in The Hague, Netherlands! Under leadership of Hans de Raadt, a local team will take care of us in the international city of peace and justice. More details on Sunday! Reimbursement of production of local materials is back! A process is being set up, led by a committee under Jim Henderson. More info will follow soon! And the Board urged everybody to have fun and learn a lot! The sessions at the conference are streamed live. You can find the feeds on bambuser. For those at the event: don’t forget to return the food card and pay so you get something to eat today, tomorrow and on Sunday! And a reminder: the conference party on Sunday evening starts at 7:00 P.M. (19:00) at the EastWest Pub, which is located right at the beach at Frana Supila 4. The pub is just south of the old town and it takes about 15 to 20 minutes to walk there from the venue. On the way you will pass Sesame where everything starts on Thursday evening. Posted in Announcements, Conference, Events, Project | Comments Off on oSC has started – follow us remotely! Bodega is a project making use of the Open Build Service. Aside from that, there are many other connections between the Bodega team and openSUSE – time to find out more! We spoke with Aaron Seigo, and discussed Bodega, Appstream, zypper, ymp and the beauty of Free Software. The most important thing is of course the ‘digital asset’ term. That can be anything. For example, applications. Applications can be self contained – think how android does its APK files. Of course, things on Linux are often more complicated. Apache isn’t exactly a self-contained thing. And look further – perl, php, ruby, they all have their own addons like gems that need managing. Generalizing further, there are manuals. And books in general. Music, movies, pictures, you can go on. Of course, the competition has these too – look at Apple or Google. Linux does not have a store where you can get such a wide variety of things. 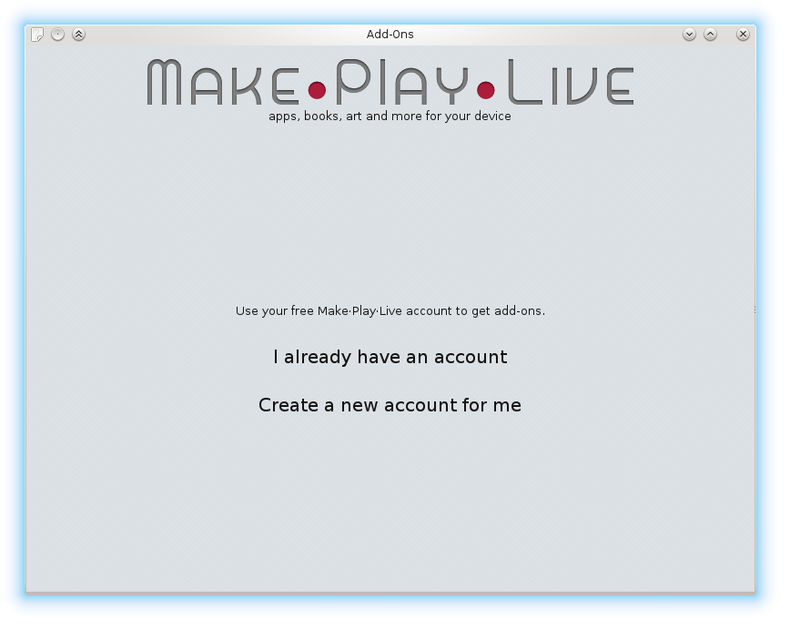 For a game, you can use Appstream, get it from Apper or GNOME’s software center. They all give a view on applications. Unfortunately, that is only useful for desktops and can handle things barely above the level of Angry Birds. If you want a python module as developers – these fancy tools won’t help you. Nor are they useful on servers. For those you have to rely on command line tools or even do things completely by hand. And it is all different between distributions. Going further, where do you get documentation? For openSUSE, that’s activedoc or the forums or our support database on the wiki. Not from zypper. Music – you can get that from Magnatune and so on. 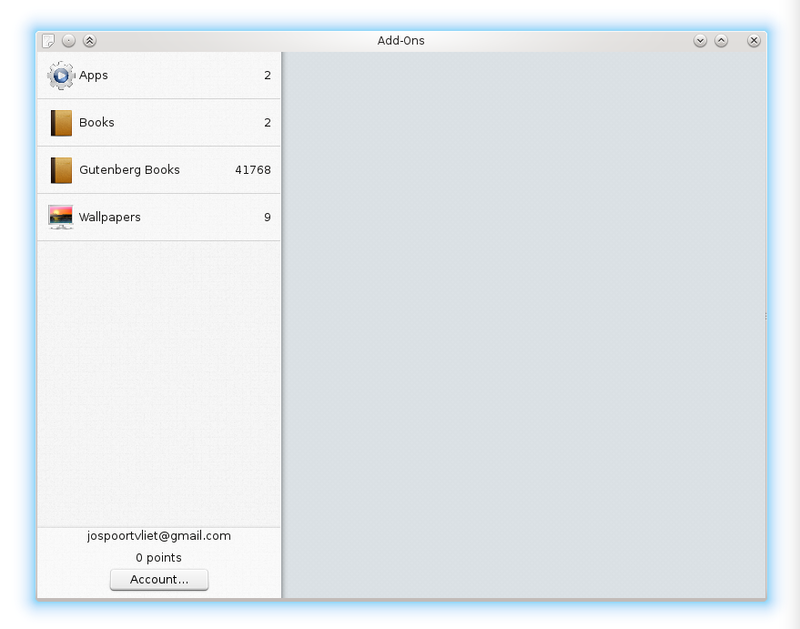 What if you can have one place where you can get a book, game, applications, isn’t that nice? That is what Bodega is. Most Linux solutions like Appstream assume their audience are users who play Angry Birds and use spreadsheets. Fair enough. Bodega takes a different approach and is far more ambitious. Bodega has all the meta data in one place and offers ‘stores’ which are views on that data. That means you can have a software developer store, for example listing all languages and their addons separate; and a server section etc. And a separate UI for the angry-bird-and-spreadsheet crowd. All from the same bodega system, filtered by tags (not static categories!). Talking about Appstream, Bodega can of course benefit from the metadata gathered for Appstream. And GNOME’s Software Center could be reworked to be a front-end to Bodega, adding books, music and lots of other digital data to its store. This is not meant to be a rewrite of what is there, or an isolated effort! And why would you build on Bodega? Bodega is open: everybody can quite easily add their own stores; or their own data sources; and add content and even sell it through their channels. It is not a closed system, on the contrary. Take the 440.000 users of openSUSE. 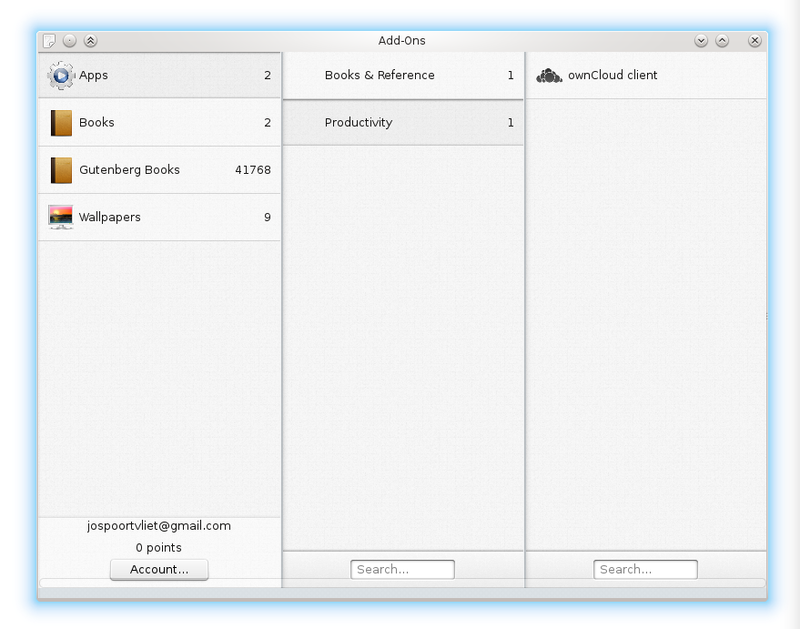 That would be a minimal amount of sales… The top-10 of paid apps in ubuntu makes less than a $100 per month of sales. Not really worth the effort. But if we could aggregate the sales between distributions, it would become relevant for third-party developers. Bodega as a cross-distribution is important! The beauty of it is that it is all Free and Open Source Software, front and back. You can self-host all you want. How do Bodega and OBS relate? Bodega and openSUSE have something in common: the Open Build Service. Not only is OBS used by the Bodega developers and do they run openSUSE on their servers, Bodega supports ymp files! Bodega is well integrated with the Open Build Service. If you create an app from OBS in Bodega, you just have to take the yaml file and fill in the missing details, adding screen shots for example. Bodega will not pull the package from OBS and store it somewhere. Instead it simply uses the one-click-install and when a user clicks on the install button, it sends the one-click-install file through. It thus does not interfere with updates, but it can show users that a new version is available and let them update from Bodega if they want. Packagers still have to add their apps to the store but we could kickstart Bodega with the apps already shipped in openSUSE, using the Appstream metadata. Non-official repos can then be added and so on. It would be quite easy to import all of the openSUSE packages. Same with the and documentation and drivers (it can show “developer: nvidia” so users know to trust it). And if there is a new revision of the documentation, Bodega can take care of that, just like it handles software updates (through zypper of course). This is where you can come in: the team is looking for help in this area and if you are interested in making this happen, come talk to the Bodega folks! You can find them on the active mailing list or the #plasma active channel on Freenode. You might be eager to find out what is there, today. Well, if you’ve seen the screenshots to the side, you know there is an app to access the store. It is build for touch screens but works just fine and you can get it in openSUSE through software.opensuse.org. 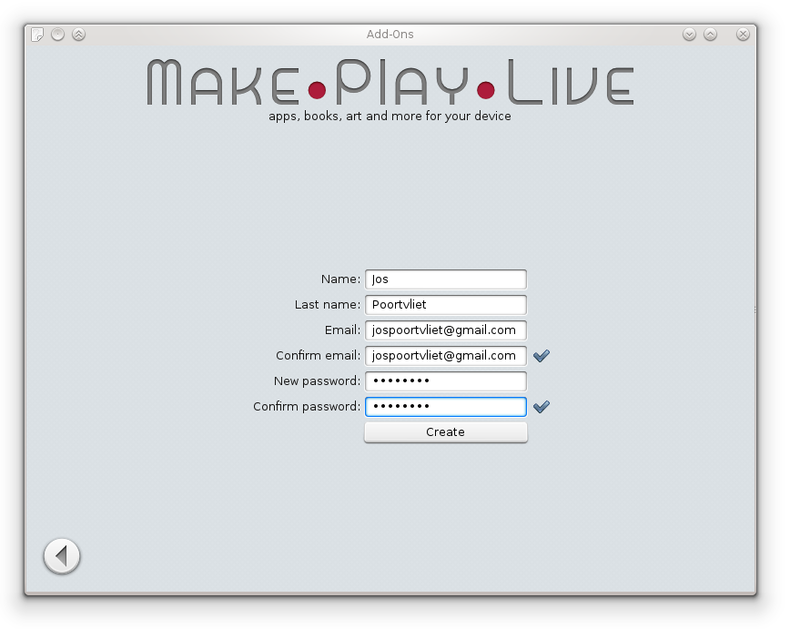 Once installed, you can fire it up typing “active-addons” in a run command dialog. Shawn Dunn (of cloverleaf fame) is putting together a more traditional desktop UI, while maintaining these packages as well. You will be able to have a conversation with him as he’s going to be at the openSUSE Conference in Dubrovnik this month where he will present a session about Bodega! He is known as SFaulken online and pretty much always hangs in the #opensuse-kde channel on Freenode where you can ask how to get things running or how to help him break stuff anytime. He’s also yelling at the world on google plus. There is work to be done to include all openSUSE Software in Bodega. 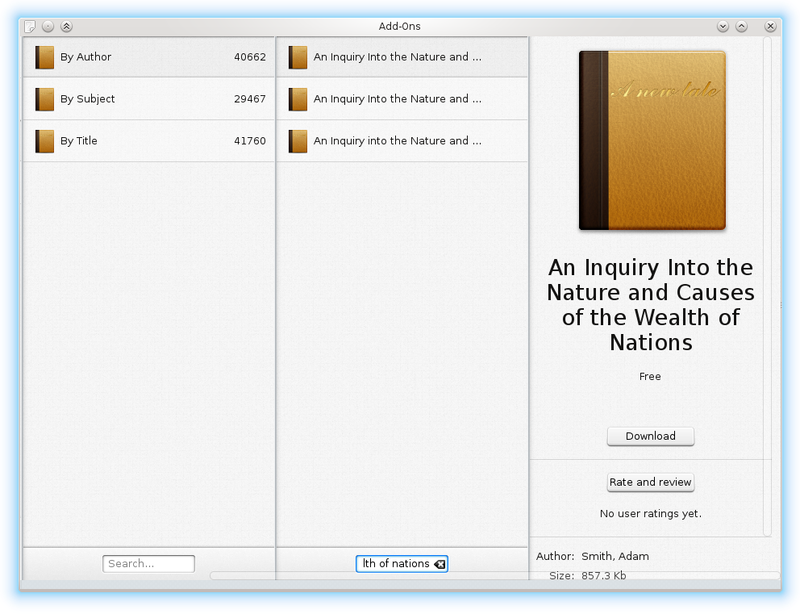 The store can use a little work too, but is based on QML which makes it very easy to improve. If you’re interested in helping out, let us know! You can contact Aaron on IRC as aseigo in the #plasma active channel on Freenode, ping him on Google+ or shoot him a mail on aseigo on the KDE.org servers. Next week, from Monday the 31st of March to the 4th of April, developers from the major Linux Desktops (GNOME, KDE, Unity and RazorQt) will meet again in Nuremberg for the second FreeDesktop Summit. The summit is a joint technical meeting from developers working on ‘desktop infrastructure’ on the major Free Desktop projects and the event aims to improve collaboration between the projects by discussing specifications and the sharing of platform-level components. Like last year, the event is supported by SUSE, which is offering the venue, the hotels and some help with organization. Check the report from last year to get an idea of what this event is about. Less than two months from the awesome openSUSE Conference will kick off. The location of oSC14 is the beautiful and historic city of Dubrovnik, located on the Dalmatian coast in Croatia. A warm and sunny weather at the beautiful Adritic sea and sandy beaches should welcome geekos from 24th to 28th of April. Dubrovnik is one of the most popular tourist destinations in the Mediterranean. It is also known as â€žPearl of the Adriaticâ€œ, and since a few years as â€žKing’s Landingâ€œ from the popular TV show that is filmed in Dubrovnik. Since 1979 the city of Dubrovnik is on the UNESCO list of World Heritage Sites. The Old Town of Dubrovnik is surrounded by city walls, medieval fortresses, Rector’s Palace and churches from different periods. It is beautiful and is Dubrovnik’s main tourist attraction, one that you don’t want to miss if you visit the city. 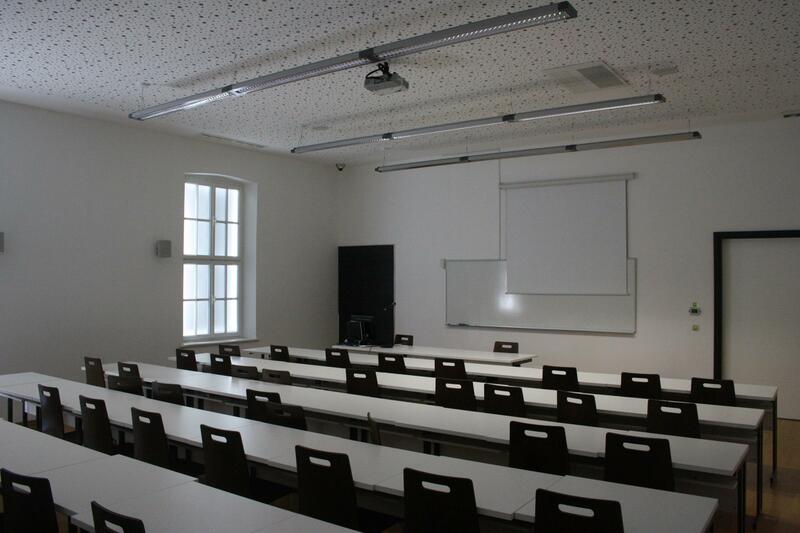 The conference venue, also known as the Campus of the University of Dubrovnik, is located just a 5 minutes walk from the Old Town of Dubrovnik. The University of Dubrovnik is the youngest university in Croatia established in 2003, but it has very long tradition in higher education that goes back to the 17th century. 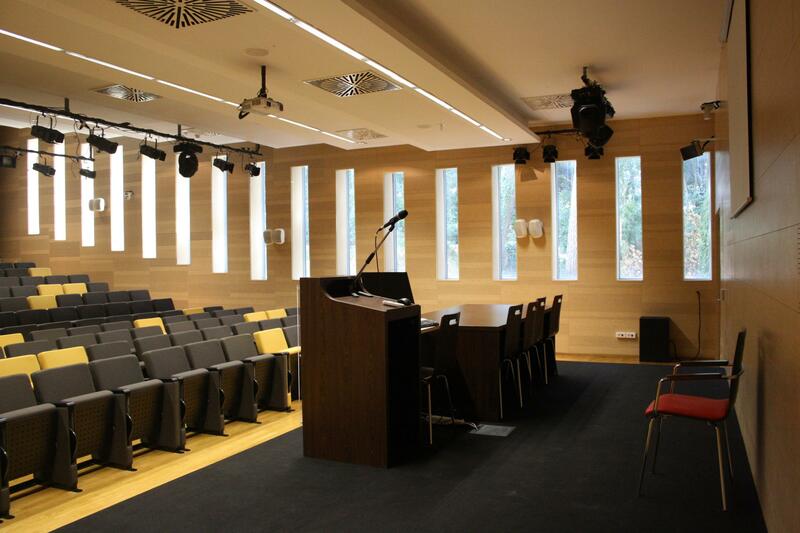 The venue was first built as a hospital, but in 2012 it was renewed and re-purposed for the requirements of the University of Dubrovnik. 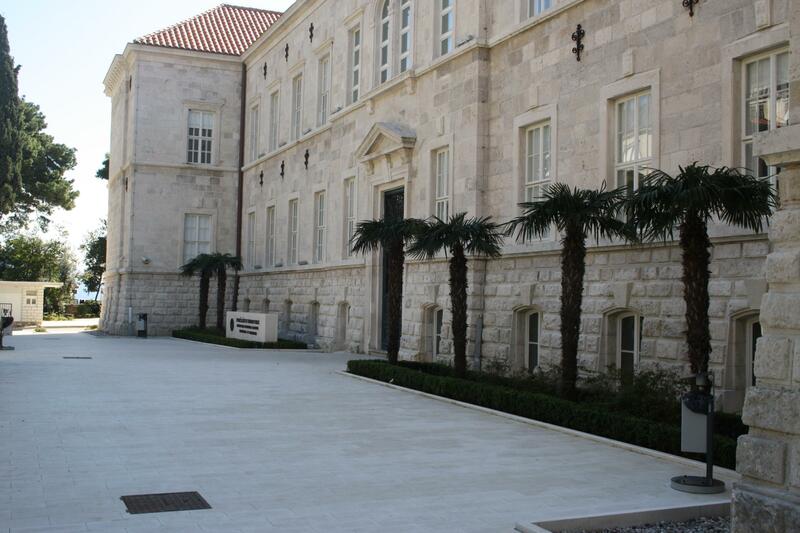 The stone walls of the Campus on the outside are following Dubrovnik’s historical architecture, but inside you will encounter very modern technology. There will be a main area with booths from various Free Software projects and some place for people to hang and hack, while the main and secondary lecture hall will host the main talks. Then there are smaller rooms, the largest of which will be mostly used for workshops while other is available for BoF sessions. Near the venue you can find all kinds of food for during lunch and dinner. The Sesame Tavern (which is where the welcoming party will be hosted) is very close and the 5 minute walk to the Old Town gets you to the large variety of restaurants and pizzerias Dubrovnik offers. You will have plenty of opportunity to enjoy the many fresh fish and other seafood specialties as well as the famous Dubrovnik orange cake! Posted in Conference, Events, Project | Comments Off on Help Promote oSC14! openSUSE Factory development is going steady and our venerable release manager has made a first milestone available. No development schedule has yet been determined, although it has been decided that we will aim for a release in November of this year. Major changes include X, Y and Z. Our normal 8-month release cycle would warrant a release in July, but the openSUSE team has proposed to change the schedule due to the work they are doing on our tooling and infrastructure. In the discussions on our mailing list it became clear a November release has much support. This is now the tentative plan and we will decide the specific schedule as well as who’s gonna do what and where at the upcoming openSUSE Conference in Dubrovnik. Meanwhile, the openSUSE team is asking for feedback, bug hunting and fixing of the new-and-improved openQA and Staging tools for the Open Build Service. Although we’re just at the start of our release cycle, this milestone already introduces a number of significant changes. Plans on what exactly will be included will be created at oSC14 next month. Cloud and databases bring xen 4.4, virtualbox 4.3.8 and postgresql 9.3. You can get the milestone as usual on software.opensuse.org/developer. You can get involved in development discussions on the factory mailing list (subscribe).